This holiday season, we decided to create lamps to pass around as a way to say thank you to our clients. Our plan was to create something both special and functional resembling the Watts brand. Having to do more problem solving than we first imagined, we went through trial and error with both the design thinking behind the project and the execution itself. Our process had several twists and turns with sketching and ideation, followed by learning electrical work and assembling the final product. Everything in this project was created from a blank slate including our lamp design, cards for personal notes and designing sustainable and stylized packaging. At the end of the day, our motivation for this project was to provide a gift to say thank you to our clients. The first few steps consisted of sketching, prototyping and learning about electrical wiring. This was a huge learning curve for our team as we slowly developed a stable concept and began to create accordingly. This process took sseveral rounds of prototyping. The final design consisted of a walnut wood base engraved with our logo, a silver metal rod for support, white porcelain socket and a gold/white cord. 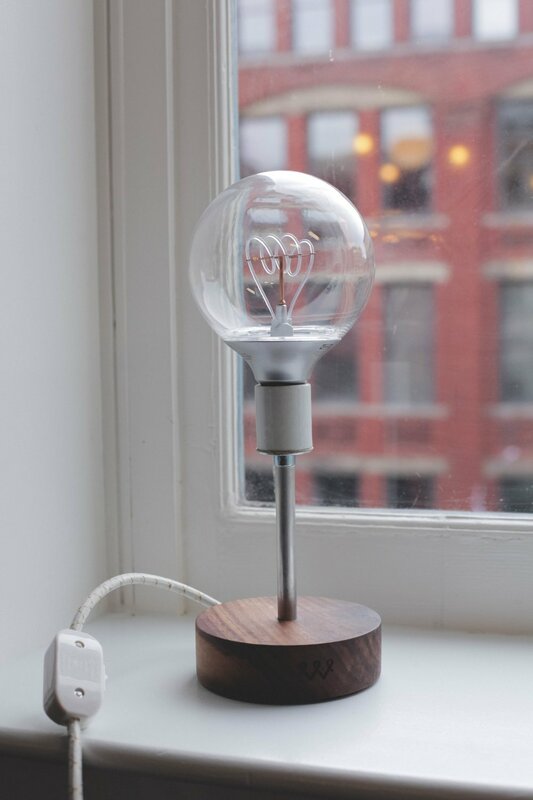 The bulb we chose is a globe-like LED bulb that has an abstract version of our logo on the filament inside.